Clever marketing, cult beauty brands, social media presence… Priceline is launching a retail takeover by offering a one-stop shop for women to cover both their beauty and health bases. The banner group is harnessing the power of social media, in-store promotions, and television advertising, boasting that its marketing reaches 93% of women over 18. A new advertising campaign that hit television screens over the weekend plays on a popular phrase to make shoppers feel at home: ‘there’s no place like Priceline’. The group also holds events to attract social media ‘influencers’ to its brands, one such event being The Beauty Prescription [LIVE], held in Sydney twice a year. These strategic events get Priceline’s name and products into the hands of popular bloggers and vloggers, who then go on to spruik the brands and the chain. They say their point of difference is providing a huge beauty range, at an affordable cost. While their products may not always reach the same low prices as some big box discounters (although they do hold big sales from time to time), Priceline Pharmacy believes it offers value as well as exclusive access to new products. 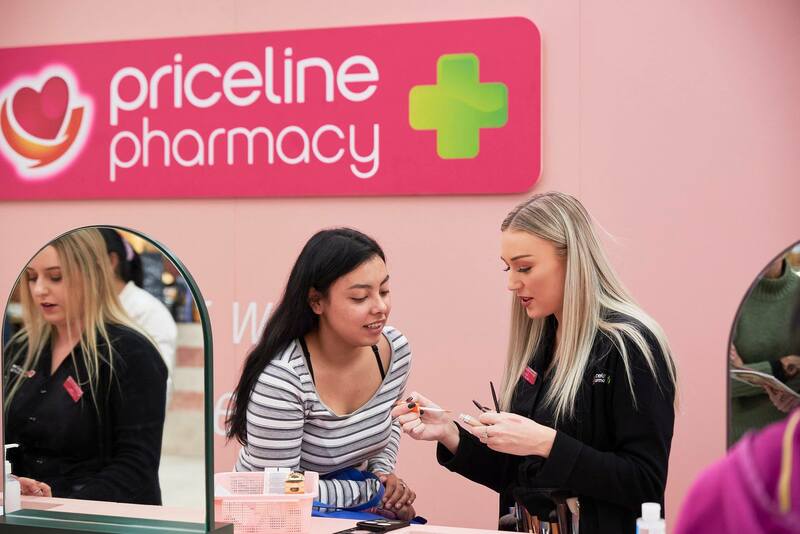 “We have an unrivaled range with 17,000 products across both health and beauty,” says Tomalin Morton, who is nearing one year in the role of General Manager of Priceline Pharmacy. Australian Pharmaceutical Industries (API) CEO and Managing Director Richard Vincent, who has been with the pharmaceutical distributor, retailer and manufacturer since 2005 and in his current role since February 2017, says Priceline has the challenge of keeping up with new trends and offering different products. “Customers keep changing and keep evolving and looking for something different. The beauty of Priceline is that you always have something new and exclusive coming through,” he told AJP. Another key issue is competing in the same space as the pharmacy discounters. “There’s a lot of discounting in the market, so as much as you need new products and you need exclusive products, you need to make sure you’re providing value,” said Mr. Vincent. Does he believe Priceline is providing value in a market dominated by big-box discounters such as Chemist Warehouse? In May this year, ABC show Gruen looked at Chemist Warehouse’s advertising strategies, describing it as “more media empire than chemist”. The show’s panel expressed dismay at the potential demise of the local pharmacy, with businessman and TV personality Todd Sampson saying that nobody would be able to beat ‘Australia’s cheapest chemist’. “The only thing that beats the lowest price here is ‘free’, and that’s not going to happen,” said Mr. Sampson. However, marketing expert Cam O’Keefe from GTB praised Priceline for its marketing strategy and said it could really lead to success. “Priceline has built their business around serving the health and wellbeing needs of women, and they’ve actually marketed or made ads that deliver to that strategy,” she said. “And it’s really refreshing for me to see this because it’s a debate you have with clients a lot. This is a sentiment that the Priceline team agrees with. Earlier this year, when AJP asked whether Priceline Pharmacy was keeping up with Chemist Warehouse, API’s Head of Industry and Corporate Affairs at Australian Pharmaceutical Industries Rob Tassie responded: “It’s really important that we’re differentiated from discounters like Chemist Warehouse. “It’s not necessarily about keeping up, it’s about being certain of what we are and differentiating ourselves. “We are very different, the elements when you look at the customer database and insights that we have, the brands that we offer and the services that we offer in store, it’s a different proposition. Priceline shoppers are loyal, she says. Their Sister Club of over 7 million members means Priceline has “Australia’s biggest health and beauty loyalty program”. Meanwhile, the brand is ramping up its strategy to dominate the beauty space, having recruited almost as many beauty advisors as pharmacists. Across its 475 stores – 334 (70%) of which are Priceline Pharmacies – the group has recruited 1000 pharmacists and 650 beauty advisors. They recently partnered with Napoleon Perdis, its first ‘prestige’ beauty brand. Such prestige brands are usually only available in department stores and cosmetics stores, but Priceline has now branched out into the market. Ms. Morton explained: “The mass shopper is really buying into prestige, and we’re starting to see that in our stores. “Prestige now represents more than 50% of the beauty market and it’s growing really quickly. We’ve also seen sales increases in skincare and in our fragrance, and again particularly in the prestige brands of fragrance. Mr. Vincent says beauty will continue to be a big part of what Priceline and its pharmacies offer, although they are not without competition. “There are some fantastic other retailers in the market like Mecca and Sephora in the beauty space, so they keep us on our toes,” says Mr. Vincent. Meanwhile, the group also wants to be known for its health programs.